The wall is 7inch thick with a good deal of rebar in it. It is a wall inside the house, so no water intrusion worries there. The wall must carry a first floor deck, appr 3 tonnes per meter wall. We have chipped off some of the honeycombing, as seen in the pics. It comes off quite easily with a hammer. Some places I can chip it off almost through the entire wall. Other places It's more superficial. Is this wall usable if we simply chip off the honeycomb and replace with non-shrinking grout? I've personally repaired areas that are far worse that what you have here. were i the project owner, it'd be tore out, and somebody else replace it. It would cost as much, IMO, to repair that, then it would to simply reform it and repour it. I know what we would do if it was on our job sites, or if an inspector was on site. Why are you pouring walls in the middle of the city dump? Do you not vibrate that? It almost looks like someone mixed that by hand. Vibrating the concrete would have helped tremendously. How much rebar is in it? What is the mix design of the concrete? I'm guessing this is a customers house? What do they think? I've never seen that type of form before, but I bet that they wouldn't stand up to vibrating. It looks like an ICF with no I, bad C, and barely any F.
I tried to do a search for that style of ply form, and no luck. Looks interesting. But with the number of ties, it would have to be expensive as hell...but any snap tie system can be expensive. You can buy a style of ICF connector that is screwed to plywood, and they remain in place when you strip. Looks like a hand mix, with possibly multiple cold joints, no vibration or consolidation at all, and a messy job site. Yes, it can be fixed. Yes, it should be fixed. No, you shouldn't fill it with mortar. It should be cut out and re-formed, and re-poured. Yes it's an ICF-system. Well spotted! The ply-forms are removed after pouring, so one ends up with EPS on one side and raw concrete on the other. The forms can be reused and can also be used for walls without EPS in which case one uses the ply forms on both sides. Thats what we did here. 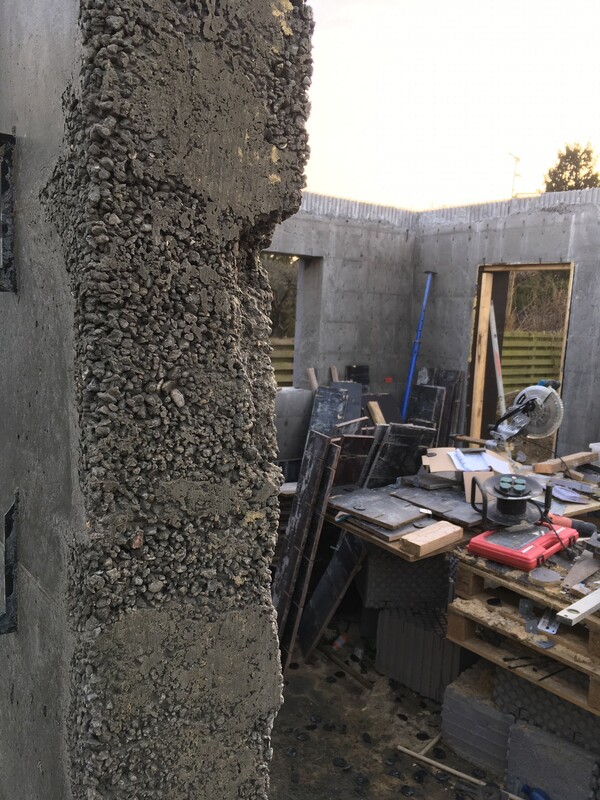 The concrete supplier sent a specialist to look at the wall and he deemed the it as "certainly usable" for the purpose it's intended to fulfill. B The honeycombed areas do not chip off that easily. It takes the backside of a hammer or some other sharp object to get the stones out. He advised us not to chip off anymore honeycombing. Just to coat it with some special two-component mortar in two layers with the same product.. First coating should be mixed to a thin solution, second to a thicker solution. My take is you are across the pond. All I can say is - you folks get away with chit there that would be buried here like a cat discovering he accidentally pooped on the carpet. Are they going to take responsibility if their solution fails in the future? I’d be finding a new redi-mix supplier.